Shop for authentic Lesotho Flags. 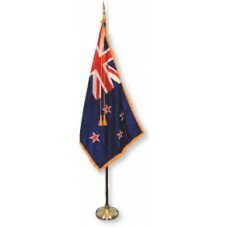 We offer indoor and outdoor Lesotho flags in durable nylon. 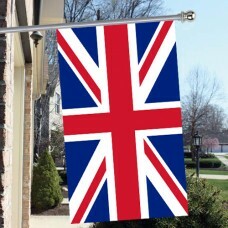 Our outdoor flags are finished with a canvas heading, while indoor flags are finished with a lined pole hem and your choice of with or without fringe. We also offer indoor and outdoor Lesotho flag sets. The Lesotho flag consists of three horizontal bands in the colors in blue, white, and green. In the center of the white band, there is a black "Mokorotlo" which is a Basotho hat. Basotho refers to the people of Lesotho. The blue color is symbolic of the sky and the rain, the white color is symbolic of peace, and the green color is symbolic of hope and prosperity. The black color of the hat (changed from brown) is used to represent a black nation and Africa's heritage. The Mokorotlo is a traditional straw hat that represents the Basotho people. 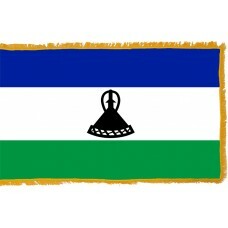 The Lesotho flag used today, was adopted on October 4th, 2006. The first Lesotho flag following their independence from the UK was adopted on October 4th, 1966, meaning that the one used today was adopted exactly 40 years after the first one, to honour the 40 year anniversary of their independence and represent a peaceful country. When the flag for 2006 was introduced, it was chosen from 4 design submissions, all of which included a Basotho hat. Lesotho officially became a country in 1818, when Moshoeshoe brought groups of people to the area, formed the country and declared himself as King. In 1868, when the country was invaded and under attack, Moshoeshoe sought help from the English Queen Victoria who agreed to help on the condition that Lesotho became part of the British Empire. From 1868 – 1966, Lesotho was a British Protectorate and since gaining independence, it still remains part of the British commonwealth. Lesotho is a small landlocked country in South Africa that is surrounded by South Africa only and does not have borders with any other country. These countries are referred to as "enclave" countries. As well as Lesotho, there are 2 other enclave countries, which are, the Vatican City and San Marino, which are both surrounded by Italy. Lesotho (formerly known as Basutoland) translates as "the land of people who speak Sesotho." The country is also known as "The Kingdom in the Sky" as it is the only country in the world that is 1,000m above sea level and even its "low point" is the highest in the world. The majority of the country (80%) is made up of mountains. The highest point and highest mountain in Lesotho is "Thabana Ntlenyana" which translates as "beautiful little mountain." The capital city of Lesotho is called "Maseru." The country's economy is mainly reliant on agriculture, livestock, and mining. Despite being a beautiful country, there is not much tourism and if tourists do visit, it is mainly due to them doing a tour of South Africa, so they generally just tend to spend a couple of days there. Lesotho is home to some beautiful sights, which include "Maletsunyane Falls" or the "Semonkong Falls" which is the highest single drop waterfall in Africa, and "Afriski" which is the highest ski resort in Africa.